A label given to value hardwoods, #3 common flooring is not inferior to higher-graded products. Rather, grading for unfinished hardwoods, based on standards by the National Wood Flooring Association, describes appearance. Top grades Clear and Select have few to no character marks and are given to hardwoods with an overall even appearance. #3 common flooring, however, is characterized by noticeable knots, mineral streaks, and color variation. Cost is a significant benefit of #3 common flooring. At $0.89 to $1.19, value flooring is priced 50-percent less than standard grade hardwoods. But the low price also has a downside: #3 common grade flooring is not covered by a manufacturer's warranty. Finding #3 common grade flooring can also be a challenge. Although well-known brands like Bruce and Armstrong carry specific value lines, most brick-and-mortar locations do not offer #3 common grade flooring. Even distributors like Hurst Hardwoods are limited by monthly selections, based on a list from a mill of the types and species of hardwoods being sold. 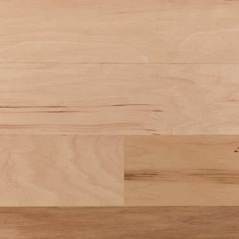 Typically, a #3 common grade is given to hardwoods that do not meet a manufacturer's appearance standards. In some cases, however, poorly-milled hardwood results in a lower grade. How can you spot poor milling? Before you install a floor of #3 common grade hardwood, check for voids, visible tree bark edges, missing tongues, splits, checks, and windshake. Many of these features present problems in installation. Because of rounded edges, boards may not evenly fit together, and your floor may end up with an uneven surface. Purchasing #3 common grade flooring is a tossup, as a box of primarily solid character wood may contain a few unusable pieces. To compensate for these potential instances, order at least 10 to 15 percent more hardwood. Additionally, when looking at #3 common flooring, ask the manufacturer why this particular shipment was marked with a value grade. Grading for unfinished hardwoods is straightforward, but prefinished flooring presents a few challenges for value products. In general, grading for prefinished hardwoods is simply a manufacturer's description used for marketing purposes. As a result, "character" and "value" flooring may not be the same. For unfinished flooring, "character" is another name given to #3 common hardwood, but for prefinished products, "character" often indicates the wood was distressed. Character grade prefinished hardwoods, then, are priced higher than value-grade prefinished flooring. Value prefinished flooring may have been assigned a "#3 common grade" – or "cabin," "tavern," or "factory seconds" – before or after a finish is added.